Eighteen-year-old Keladry of Mindelan has come a long way since she struggled through the trials and tribulations of her first year as the only female page in Tortall. Now that she's finally a knight, she is excited to be given her first assignment, particularly as the realm is gearing up for war against Scanra. A vision she received in the Chamber of the Ordeal in the previous book leads her to believe she will come up against a necromancer, who is using the death of children to fuel horrific fighting devices on behalf of the new ruler of Scanra. She is itching to get started - and then she receives her first assignment: she is not to be on the battle lines after all. Instead, she is to be the commander of a refugee camp. Babysitting duty, she thinks angrily, but of course she swallows her disappointment and takes charge of the new camp and its embittered survivors of war. Bernadette Dunne is such a wonderful audio book reader that I simply had to wait for the audio version to finish up the Protector of the Small quartet. 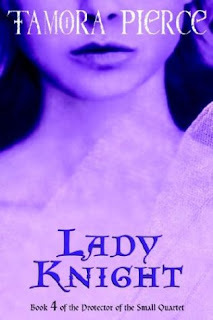 This book is a departure from the others in the series, which are more about Kel's schooling, her struggle to be accepted as a fellow warrior and a female. Now that Kel is a knight, her challenge is to prove her worth despite her inexperience, and she, of course, is more than able to rise to the challenge. She is strong and determined and willing to make personal sacrifices in order to do what is necessary and right. This novel focuses more on war and military strategy, and there is a much larger cast of characters, so my emotional involvement was mostly limited to Kel. She is focused only on her goal, and there is no time to spare for romance - but that was all right with me. Kel is doing what she has trained for since she was ten, and she never loses focus on her goal. The book's pace sags in places, but the characters are so interesting that I didn't really mind. As it moves towards the conclusion, the tension ratchets up, and there is a nice long denouement that ties up loose ends in a most satisfying way. I very much enjoyed this series and Keladry's coming of age, and I was sorry to say goodbye when I reached the end of this final volume. Bogormen: "While I still love the book, I guess this is my least favourite of the quartet. Not that it's not well written, it just gets repetitious at times, and could probably easily have been 50-100 pages shorter." Off the Shelf: "I am not sure exactly why this book fell flat. In the third book Kel was having some interesting relationships with other squires and in this book nothing. Not a hint of romance. She kind of swears off men. Lame." I've read the first 3, but I lost interest at the beginning of the 4th. They are good, but maybe I'm too old for them. Denise - I think the series may have lost a bit of momentum at the end of the third one, when really, it was a pretty satisfying ending. This one wasn't my favorite of them, but I did enjoy it, and it was good to see Kel come into her own. I might have enjoyed it more when I was younger, too! Kailana - I think the first one is my favorite, but I did enjoy them all. I'll be interested to hear what you think when you get to it at some point! It's been a few years since I read the Tortall books (the first three quartets, anyways - I still have the Trickster books and the prequels to go), but I remember that Protector of the Small was my favorite quartet - or at least Kel was my favorite heroine. Fyrefly - It's been a long time for me, too, as far as the first ones go. I'm planning to read the first Alanna one to my kids at some point, but they might get to it before I do. Another series I really want to read as well. I can't remember if it was you or someone else who first recommended them to me. First in a Series Challenge!